Have you ever experienced tournament brain drain? That mild quicksand feeling of dulled senses, mental fatigue, and lack of sharpness? When it happens, you need to get your head back to its optimal arousal level, quickly. But we can also use some tricks to prevent it from happening in the first place! 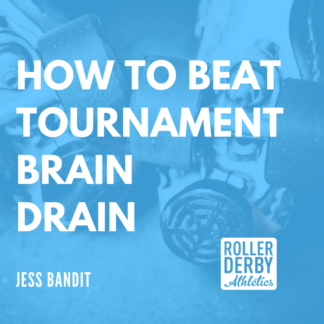 Jess Bandit’s Mental Muscle today will help keep you and your derby-brain focussed for roller derby tournaments, so you can stay sharp to the final jam. 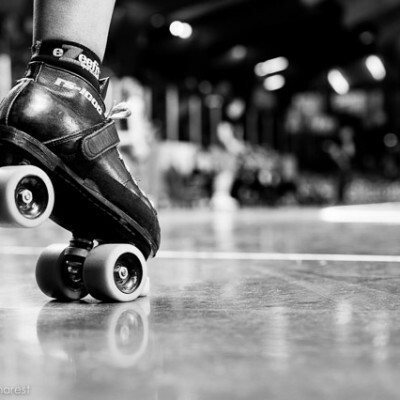 Roller derby travel teams are no strangers to tournaments. It’s an effective way to play multiple teams over the course of a weekend. 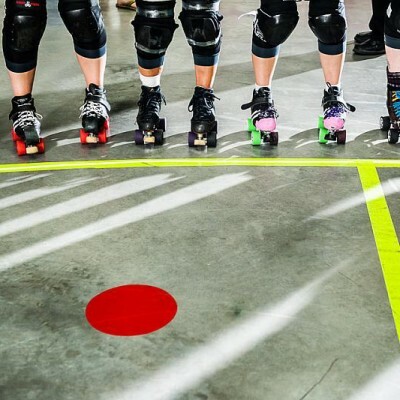 This past weekend, Montreal Roller Derby hosted La Classique Georgia W. Tush, which brought teams from Jacksonville, FL, Austin, TX, and Manchester, UK to Arena St.Louis. Watching the tournament from a mental performance coach point of view made me realize that many athletes don’t understand how exhausting a tournament can be. Yes, fatigue has a large impact on performance, but have you ever realized the impact on your emotions, thinking abilities, and general mindset? Think about when your muscles feel sore: the soreness could result in feeling sluggish or slow. Well, the same thing can happen with your brain. You might feel a decrease in your energy levels, reaction time, or alertness. Playing at your peak performance requires strong focus, and an ability to reaction to situations (plays) happening in front of you. This is why it’s important to be able to give your brain and senses a rest. You wouldn’t head to the gym between games, so why overload your mind? This is why I am a big fan of a ‘check in and check out‘ system, because it forces you to think of your brain as a muscle, and just like the rest of your muscles, you need to warm up, cool down, and rest that muscle between your ears. Try to follow the same routine before each game. By keeping the same approach, you’re reducing the risk of making the tournament a stressful or big deal in your mind. Even with a set pregame routine, you need to be flexible. Realize that you might have to make some modifications to your routine depending on the time limit between games or your surroundings (in and out of the venue). Once you are checked in, then you should be mentally ready for the game. Remember that even the top athletes in the world sometimes need to re-adjust their mental game during a competition. At least with checking in, you know that you’re starting the game in the best mind frame. 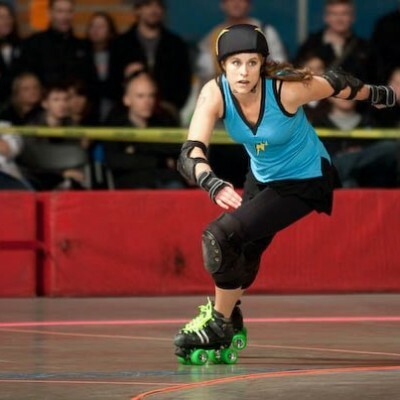 During a roller derby game, your brain is working hard to keep up with the ever changing environment. 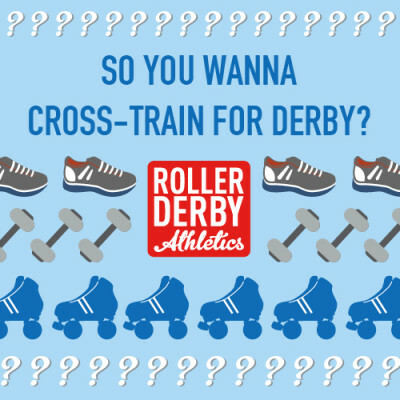 If you want to be ready for the next bout, you need to be checking out afterward. Think of checking out as a cool down for your mind, which could be easily added to a regular cool down / stretching routine. It’s a time to analyze and reflect on the game and your own performance. This process of analyzing and reflecting opens the door to creating personal goals for your upcoming games. It helps you narrow in on what would you like to improve on or achieve in the next game. Whether you had the performance of your lifetime or one you weren’t proud of, by checking out you’re putting that game in the past. It also allows you to think about the next game in the tournament. Throughout a tournament weekend it’s important to have moments where you’re completely checked out from roller derby. Watching other games at the tournament is such as great learning tool, but when you’re playing a game later on in the day it can exhausting for your mind; your brain is analyzing techniques and plays. So it’s important to take breaks where you completely check out of roller derby to give your mind a rest. When it comes to keeping a positive and focused mindset throughout a tournament, and avoiding the dreaded brain drain, it’s important to remember to follow these simple check in and check out routines at the appropriate moments. Remember that recovery and rest is just as important as training and competing. Make sure that you are replenishing your body with appropriate food, staying hydrated, and getting an adequate night’s sleep. Most importantly, treat every tournament day as a new beginning. Wake up in the morning knowing that you will play your best today! Got some other tournament tips you’d like to share, that keep your mental focus fresh? Leave a comment below!